Teacher Managers coach employees on the basis of their own knowledge and experience, providing advice-oriented feedback and personally directing development. Many have expertise in technical fields and spent years as individual contributors before working their way into managerial roles. Always-on Managers provide continual coaching, stay on top of employees’ development, and give feedback across a range of skills. Their behaviors closely align with what HR professionals typically idealize. These managers may appear to be the most dedicated of the four types to upgrading their employees’ skills—they treat it as a daily part of their job. Connector Managers give targeted feedback in their areas of expertise; otherwise, they connect employees with others on the team or elsewhere in the organization who are better suited to the task. They spend more time than the other three types assessing the skills, needs, and interests of their employees, and they recognize that many skills are best taught by people other than themselves. Cheerleader Managers take a hands-off approach, delivering positive feedback and putting employees in charge of their own development. They are available and supportive, but they aren’t as proactive as the other types of managers when it comes to developing employees’ skills. The 3rd style, the Connector, has according to HBR, proven to be the most successful style to grow needed competences in employees. This is similar to the how we see that an Agile leader need to coach their employees to enable well functioning competence development in autonomous Agile teams. Here are two coaching tools that I’ve found very helpful over the years doing this. When working with change we like to help people not just learn something new, but first experience something new. The experience help people to much easier understand why the change is needed, as well as making it easier for them to also know how it feels when it is working in a good way. This is an experience based game created by me and my former colleague Per Lundholm, as a part of our training for x-functional teams. 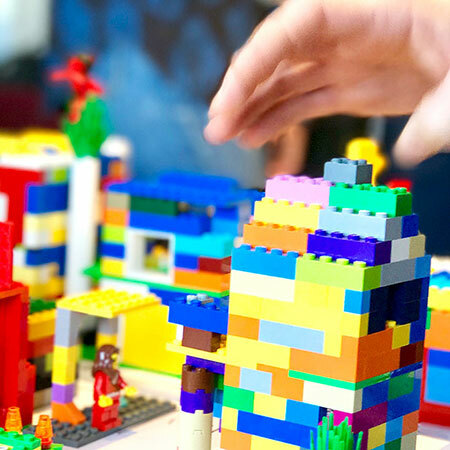 The idea behind the game was to help team experience and understand the difference between working only with their core expertise and how it is when you help and grow your team mates T-shape and competences so that the whole team learn a bit from every one else. 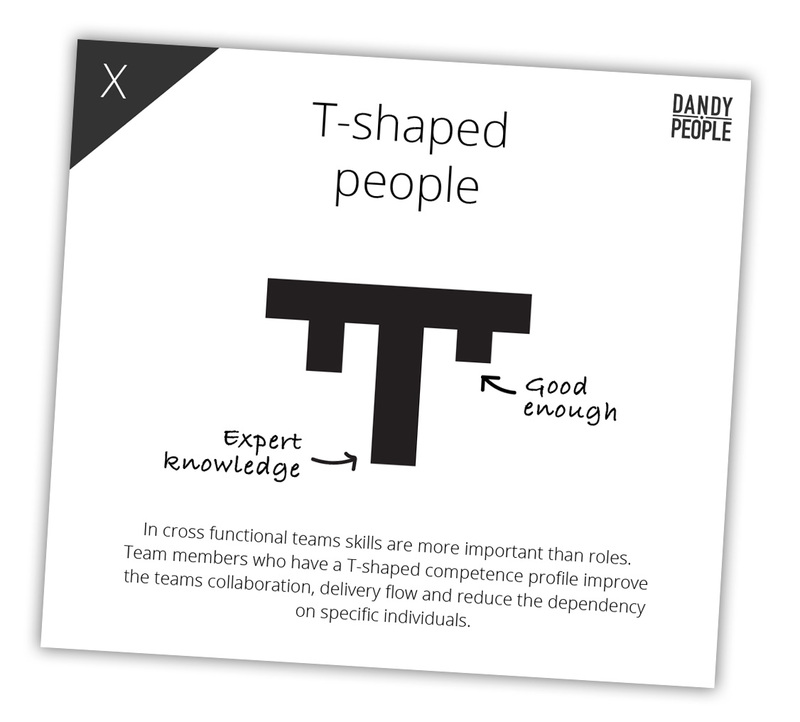 The T-shaped team outperformes the team that works only in their expert roles by far, and it also feels much more fun when the team can work on tactics together to deliver. We have played the game many times with different teams and in different organizations and the discussions might be a bit different dependent on their real situation, always with great result helping teams to get started in their journey to collaborate and build new knowledge. As a follow up on the X-team Silos Game I usually do some kind of a exploration of peoples true T-shapes, the different skills they have and how they would grade themselves. Ask everyone to write down what skills they think their team mates have for about 10 minutes. This is usually a great warm-up for the team. When doing this you can either ask for hard skills, or soft skills, or just let them do as they please. In new teams or with new team-members they might not know the hard skills, but soft skills might be easy and safe as well as a great team building exercise. A hard skill is what you use in your work, a soft skill is a behaviour you have that might be important for the team as well. Then ask them to read them up and give them to each team member. And they can if they like add these skills to their own poster where they seem it fit. Ask them to write down their own hard skills one and one on stickies for about 10 minutes. And then ask them to put each skill in the grading they think it fits. If they think they are good enough on a skill they put it on #3 and so on. When all are done in each team, ask them to present their poster to the others in their team. Usually this is quite fun, and other team members might also want to give their team members new skills that they see are missing, or they might not agree on someones grading, usually to the favor a higher rating. If you are facilitation several teams you can walk around and observe how the teams are doing, what conversations they have and how the mood in the teams are. Ask them to put them on the wall and do a gallery walk – have them walk around and look at each others posters, between the teams as well. When doing this you can ask them to keep an eye on who could possibly help them to grow the skills they want to grow, it could be someone in their own team, or someone else. As a follow up on this off course there could be several things you can do, perhaps setting missions for the teams and what skills are needed in each team, having all teams visualize their team members T-shape on their team board, and off course getting started with team activities to start sharing skills with each other, such as mobb-and pair work or starting up competence sharing groups.